Feeling dim from energy code confusion? Read on to give your inspections a charge. The U. S. Department of Energy’s Building Energy Codes Program addresses hundreds of inquiries from the energy codes community every year. This article offers clarification for topics of confusion submitted to BECP Technical Support that are of interest to electrical inspectors, focusing on the residential and commercial energy code requirements based on the most recently published 2006 International Energy Conservation Code® and ANSI/ASHRAE/IESNA1 Standard 90.1-2004. One- and two-family dwellings should comply with residential code requirements. Multi-family dwellings with three or more attached dwelling units and three stories or less above grade should comply with residential code requirements. All other buildings, including multi-high-rises, should comply with commercial code or standard requirements. But when buildings are three stories or less in height and are designed for both residential and commercial applications, when should the building meet the commercial energy code requirements or the residential ones? The answer to this question depends on building height and occupancy, or on what percentage of the building is used for what purpose. 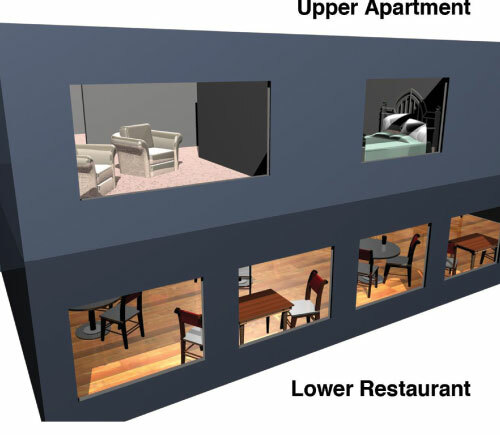 Predecessors of the 2006 IECC and ASHRAE 90.1-2004 specify that for buildings three stories or less designed to have both residential and commercial applications, the occupancy per floor (90 percent or greater) determines the code used. For example, if 10 percent or less of a one-story building is used for residential applications, then the majority occupancy—commercial—determines the energy provisions. The occupancy rule was revised for the 2006 IECC and ASHRAE 90.1-2004 such that the percent occupancy for each application must be shown separately for code compliance. all portions of historic buildings. Even if a building is exempt from the building envelope, provisions for the lighting, service water heating, and mechanical (if any) are still applicable. The prescriptive method uses a table of minimum efficiency requirements for individual building components, including insulation levels for ceilings, walls, floors, basement walls, slabs, and crawlspace walls. The insulation levels are listed as simple R-values (resistance to heat loss where higher is better) and refer to the insulation only, not to the overall thermal properties of the components. Any type of insulation that achieves the minimum R-value is permitted, and the R-value of insulation installed between framing members can be simply added to that of any insulating sheathing or other continuous insulation layer, making compliance and enforcement very straightforward. This prescriptive table also gives minimum requirements for fenestration, which comprises doors, windows, skylights, and glazed blocks. 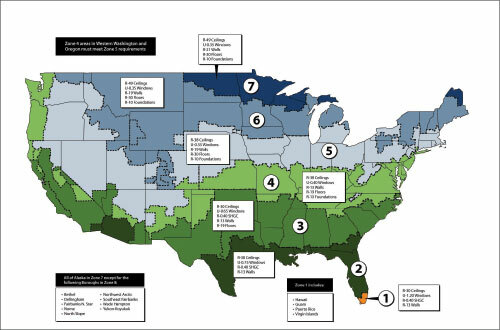 See the 2006 IECC prescriptive table athttp://resourcecenter.pnl.gov/cocoon/morf/ResourceCenter/article/1596. The prescriptive path can also use an alternative table based on component U-factors (rate of heat loss where lower is better). In contrast to the R-value table, the U-factor table applies to the entire component assembly, not just its insulation. This allows for innovative or unique construction alternatives but requires accounting for the thermal properties of framing members and other structural components as well as insulation layers. The U-factor table can also be used in atotal UA alternativeapproach that permits trading of higher efficiencies in some building envelope components for lower efficiencies in others. DOE provides code compliance software, REScheckTM, that will create a printable compliance certificate and inspection checklist to the 2006 IECC using the UA alternative approach. It can be downloaded free of charge from the BECP website:www.energycodes.gov. The performance path requires a detailed calculation of the energy consumption of a proposed home to be compared with a similar calculation for a home that would just meet the minimum prescriptive requirements. This allows greater flexibility than the total UA alternative, providing compliance credits for features such as high-efficiency furnaces and air conditioners, tested airtight ducts, and various approaches to solar control. The performance path considers some home features that are not regulated by the prescriptive path, such as glazing orientation. This method generally requires the use of software tools that implement a number of IECC-mandated calculation capabilities. Computer-savvy users will notice that the simulation rules are quite similar to those used in home energy rating systems of the Residential Energy Services Network and to those mandated for use in home energy tax credit qualifications. While DOE does not certify or otherwise recommend any specific software packages for performance compliance, a list of energy-related software packages is available athttp://www.eere.energy.gov/buildings/tools_directory/subjects_sub.cfm. Both also provide Mandatory Control requirements and Interior LPD and Exterior LPD limits for electric power and lighting systems. Theprescriptiveandtrade-offmethods of compliance for the thermal building envelope will be addressed here as well as the mandatory control, interior LPD and exterior LPD requirements for electrical power and lighting systems. The total buildingperformancemethod that encompasses all building energy use will also be covered. Buildings are limited up to 3 percent glass to roof area. The trade-off compliance method permits trading higher efficiencies in some building envelope components for lower efficiencies in others. A compliance documentation tool for the trade-off method used by most states is the COMcheckTMsoftware, provided by DOE free of charge via its website,www.energycodes.gov. COMcheck provides a highly flexible way to demonstrate compliance with minimal input. It demonstrates building envelope and lighting compliance separately. COMcheck supports several commercial codes and standards, including several versions of IECC and ASHRAE 90.1; documents mandatory requirements; and includes a printable compliance certificate and inspection checklist. The software is also supported with accompanying user guides, videos, training materials, and compliance manuals at no cost. ASHRAE 90.1-2004 and IECC 2006 include requirements for interior and exterior building lighting in new construction, additions, and alterations for all commercial buildings, including residential structures with four or more stories above grade. The application of the codes to alterations has been mixed in the past, but as energy codes become more commonplace in states and local jurisdictions, alteration projects will be required to comply as well. The requirements for alterations are effectively the same as for new construction or additions in that the replacement of lighting systems and any new or replacement control devices must comply. ASHRAE 90.1 versions 1999–2004 provide an exception for spaces where less than 50 percent of luminaires in the space are replacedandthere is no increase in the lighting power density (LPD). The requirements refer to the replacement of “lighting systems”; therefore, component replacements (lamps and/or ballasts) alone do not constitute an alteration. Prescriptive compliance for lighting systems involves primarily the application of mandatory control of lighting systems. Mandatory Individual Space Control—Energy codes require at least one lighting control for each room or space enclosed by ceiling-height partitions. In general, these controls must be readily accessible to occupants, but remote location is allowed to accommodate areas where safety or security is a concern. Both ASHRAE 90.1 and IECC require that permanently installed and switched receptacle lighting in hotel or motel guest rooms be placed at room entrances (IECC 1998–2006 exempts bathroom lighting). The ASHRAE 90.1 versions 1999–2004 also require individual control of display or accent lighting, case and task lights, and nonvisu-al and demonstration lighting. SHRAE 90.1-2004 adds requirements for occupancy sensor controls in some classrooms, conference rooms, and employee break rooms. IECC versions 1998–2006 include a bi-level switching requirement for all spaces with the capability to uniformly reduce the connected load by 50 percent with some exceptions. Mandatory Automatic Shutoff—Automatic shutoff of all building lighting is required in both ASHRAE 90.1 versions 1999–2004 and IECC versions 2001–2006 for buildings larger than 5,000 square feet. This can be done with time-scheduling devices, occupant-sensing devices, or a similar signal from another control or alarm system that indicates the area is unoccupied. It is also a requirement that occupants be able to override the automatic shutoff control for a maximum of two hours in IECC versions 2003–2006 and a maximum of four hours in ASHRAE Standards 90.1 versions 1999–2004. Exceptions to the entire automatic shutoff requirement include lighting for 24-hour operation in ASHRAE 90.1 versions 1999–2004; patient care spaces and areas with safety or security concerns in ASHRAE 90.1-2004; and corridors, storerooms, restrooms, public lobbies, and guest rooms in IECC 2004. Mandatory Exterior Lighting Control and Other Requirements—Exterior lighting requirements call for automatic controls capable of turning off exterior lighting when sufficient daylight is available or when the lighting is not required during nighttime hours. Exterior lighting not designed for dusk-to-dawn operation must be controlled by an astronomical time switch. Other exterior lighting designated for dusk-to-dawn operation can be controlled with an astronomical time switch or a photosensor. Astronomical time switches must have battery back-up capability of at least 10 hours. Covered vehicle entrances or exits from buildings or parking structures where safety, security, or eye adaptation are of concern are exempt from these control requirements. Efficacy—Lamps used in exterior-building luminaires are required to meet minimum efficacy levels of 60 lumens per watt for lamps operating at greater than 100 watts. Exemptions to this requirement include lighting controlled by an occupancy sensor as well as other exempted lighting listed in the Power Density section below. In addition, ASHRAE 90.1 requires tandem wiring of fixtures when single-lamp magnetic ballasts are used. Limits are also placed on exit signs with a limit of five watts per face for most of the codes. Mandatory lighting requirements cover a lot of items that can affect building design, but that’s only half the story. The other major requirement in the energy codes is the limitation of lighting power. The requirements for interior and exterior lighting power limits are prescriptive in nature but are applied in a trade-off method. Most buildings comply with the simpler prescriptive/trade-off method for lighting. This method compares the actual interior LPD (watts per square foot) to the LPD allowance. The first step is to determine the installed lighting wattage for the entire lighted space(s) in watts. This must include all interior lighting designed for general, ambient, or task illumination with exceptions. The codes also provide some guidance on how certain fixture-type wattages are calculated. This includes the maximum labeled wattage for screw-in-type fixtures and a minimum of 30 watts per foot of line-voltage track lighting. Note that the line-voltage track calculation is changed in the 90.1-2007 version to allow the use of current limiters and the breaker size for compliance. The second step of the process is to determine the allowed wattage for the building. This is done on a whole-building (one LPD value for the building type) or space-type (LPD values for each different space type) basis. In either method, the appropriate LPD(s) is chosen from the whole-building (32 in ASHRAE 90.1, 26 in IECC) or space-type (91 in ASHRAE 90.1, 28 in IECC) tables. These values are multiplied by their matching square footage, and the results are summed to determine the allowed lighting power in watts. If the calculated installed watts is less than or equal to the total allowed watts, the project is in compliance. The whole-building method uses one value for each building type, which makes the calculation simpler but limited in flexibility. The space-type method requires more calculations but also allows more flexibility and can provide more allowed wattage. The LPD values in the current codes and standards were not chosen by simple consensus or other limited-selection processes. The values were developed using an extensive space-type modeling process that incorporates the latest light-level recommendations, current energy-efficient product characteristics, applicable light-loss factors, and designer input on quality design metrics. To view details on the process as well as a list of the values in ASHRAE 90.1-2004, visit the Illuminating Engineering Society of North America (IESNA) website athttp://12.109.133.232/cgi-bin/lpd/lpdhome.pl. To accommodate the quality and art components in a wide variety of lighting designs, codes provide additional lighting power allowances. These are use-it-or-lose-it allowances and must be used only for the designed purpose and not for general illumination. In addition, these allowances can only be applied if using the space-type method. The current allowances prescribe additional wattage for decorative lighting at 1.0 watts per square foot, lighting specifically designed to meet the IESNA computer screen glare guidelines at 0.35 watt per square foot, and retail display lighting at 1.6 watts per square foot of display area, or 3.9 watts per square foot for fine merchandise display. Note that the application method for additional retail allowances is drastically changed in the 90.1-2007 version and future IECC versions. 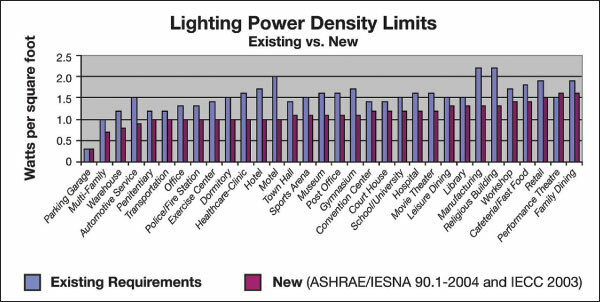 ASHRAE 90.1-2004 and IECC 2006 have extensive power limits based on square footage of illuminated area or perimeter for all expected exterior applications such as entrances and exits, façades, building grounds, parking lots, and walkways (see table 1). These requirements are divided into two application categories: tradable and non-tradable. Tradable applications work like the interior lighting limits such that the important factor is total wattage compared to total allowance. Non-tradable applications are specific limits to a lighted feature and cannot be combined with other features. Some design flexibility is provided with an additional unrestricted allowance of 5 percent of the total designed wattage to be used wherever desired. Compliance with the LPD requirement is achieved when the total designed wattage (not including the 5 percent added or exempted lighting) is not greater than the total wattage allowance calculated for both tradable and non-tradable applications in Table 1. Both ASHRAE 90.1-2004 and the IECC have a whole-building code compliance methodology in addition to their prescriptive requirements. A whole-building code compliance methodology lets you compare your proposed design to a baseline or budget building that just meets the prescriptive requirements of the code or standard. In ASHRAE 90.1-2004, the whole-building method is called the Energy Cost Budget Method. In the 2006 IECC, the whole-building method is called Total Building Performance. Both methods are similar because they use the prescriptive requirements of the code or standard as a baseline or budget and they are based on energy cost comparisons (baseline and proposed). However, they also vary greatly in amount of required input detail; the Energy Cost Budget Method is the more detailed of the two. Much of the detail in the Energy Cost Budget Method focuses on allowing the modeling of systems that may go beyond minimum requirements. For example, ASHRAE 90.1 does not mandate the use of a particular type of heating or cooling system; it only requires that the system meet a minimum efficiency. Any system can be used, including hydronic or forced-air systems, heat pumps, boilers, furnaces, and more. For the Energy Cost Budget Method, the system of choice is compared to a baseline or budget. This requirement comparison prevents “gaming” of the method. For example, if you were planning to put a gas-forced air furnace in a Pennsylvania building, you would benefit by identifying the most costly baseline or budget system you can think of for the comparison. In a cold climate with high electrical rates, that most costly system may be an electric forced-air system. However, the Energy Cost Budget Method would not allow this comparison. Because the proposed system uses fossil fuel, the Energy Cost Budget Method would require comparison to a common fossil fuel heating system—typically either a fossil fuel furnace or fossil fuel boiler. The IECC does not mandate what type of system is used in buildings either, but the Total Building Performance Method does not attempt to control the baseline or budget design nearly as much as the Energy Cost Budget Method. This may allow more gaming of the method in the IECC. Recognizing this and acknowledging that BECP’s Technical Support has received very few inquiries on use of the Total Building Performance Method, indicating that the Energy Cost Budget Method is much more widely used, DOE has submitted an IECC code change proposal to replace Section 506 of the IECC. This proposal was accepted at the IECC Code Development Hearings and will be discussed at the Final Action Hearings later this year. Compliance with energy codes is typically a combination of documenting the proposed energy features of the building and passing related inspections. Many jurisdictions require documentation of the proposed design before issuing building permits. The form of documentation will depend on what the local jurisdiction requires. With energy code compliance, the final application and interpretation rests with the local building official. To obtain a copy of the IECC, go towww.iccsafe.org; to obtain a copy of ASHRAE 90.1, go towww.ashrae.org. Need more clarification about energy codes? BECP’s website, www.energycodes.gov, provides a wealth of technical resources to lighting designers, engineers, architects, code officials, building inspectors, and others involved in creating code-compliant energy-efficient buildings. The site offers free compliance tools, technical support, articles on code issues, and extensive connections to other resources.